I always get excited at the start of a new month. It's like a mini reset button that allows us to get reconnected to what me most want in life. Setting monthly goals is one of the most fruitful habits you can ever have. Maybe, this month, you reach all of your goals. Maybe not. But the act of setting the intentions gets us much closer to our outcomes than if we did nothing at all. Not only are we jumping into a new month, we are also enter a change in season in September. The first priority I've set for the month is to clean and organize my closet. I don't have a lot of closet space so it gets cluttered quickly. One thing I've noticed is when my closet is in shambles, I can never find anything to wear. But when clothes are organized, it's easy to pick out outfits. Once upon a time, I sat in a meeting where the CEO of my former organization was invited to speak. Instead of talking to us about business strategy, he opened the conversation with how important it was to him to make sure his closet was organized. He said that this was a mark of having real discipline because no one else saw your closet. You invest that time into yourself. Every day we stand in front of our closet before getting dressed. 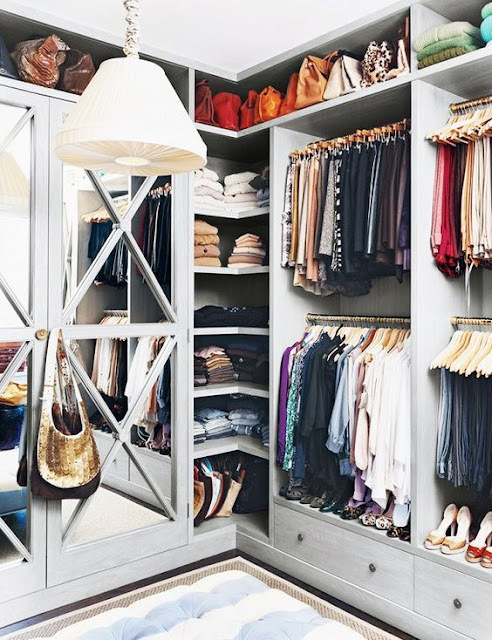 The way your closet looks could have a bigger impact on the direction of your day than you know. Somehow, over the past few months, I almost completely abandoned many of my morning rituals. I somehow convinced myself that I could use the extra time to squeeze in a little more work. Unfortunately, when the rituals are gone, so are the benefits that come with it. I'm that person who's quick to kill the goose once I've gotten my golden eggs. Then I wonder why the eggs stop showing up. This month, I'd like to nurture my "goose" by focusing on the rituals that impact me the most. I want the wonderous benefits of meditating daily, drinking lemon water, morning exercise and planning my day. For the past week I've reintroduced those rituals into my day and, the benefits have already started showing up. Last year, I went on a "new experiences" spree. I introduced several new activities into my life like such as the float tank, infrared sauna detox, etc. The result of my experiment was quite interesting. New actions bring new results and that certainly was the case last year. It set my life in a new direction. I found myself saying yes more. My business grew, my mood was high, everything was going right. I want to replicate those results by purposefully engaging in new experiences as much as possible. The first new experience this month was getting a B-12 shot. I've wanted to get one ever since I first heard of IV Therapy. The first day or so, after my shot, I didn't notice anything different. By day 3, I realized that I was feeling less lethargic. Now, when I'm bored, I get up and do something productive instead of mindlessly surfing the web. I love being more productive because I'm getting so much done. When I heard that increased energy could be a benefit, I thought I'd be feeling wired and wouldn't sleep. That wasn't the case for me. I sleep well but I feel alert during the day. Another new action on my to-list is to get blood work done to check my vitamin levels. I want to know for sure which vitamins I may be deficient in (if any) so I can supplement accordingly. Especially as we head into the winter months. If the B12 shot had a such a positive impact, who knows what can happen if I continue to supplement based on what my body needs. New experiences don't have to be drastic. For instance, if I worked from home all week then next week, I'll work at a cafe for a few days. What's more important is that I don't relive the same exact week over and over. It's about looking back over the past week and identifying what I can do to make it even better! These are my overall focuses for the month. I also set some business & personal goals to reach. But this month, I have to make sure that my specific goals are stepping stones that lead to much larger intentions. Short term goals are great but it's important to connected them to the bigger picture. Loved this article and your website. It's so inspirational. I spent the entire month if August reading all of your archives! Thanks for what you do. I've been thinking about a blog myself.